I must have 600 or more different fabrics in my studio! Thankfully I’m getting better about buying fabrics which work well in my art quilt designs as opposed to buying every piece of fabric I like. When I start a new quilt, I get out all the fabrics I think I might want to use. When making a design like a sunset or sunrise quilt, which I have done many times in the past, I’ve lately tried to think outside the box I sometime put myself in….that is, I want to look past similar quilts I’ve made before and try selecting some new fabrics. 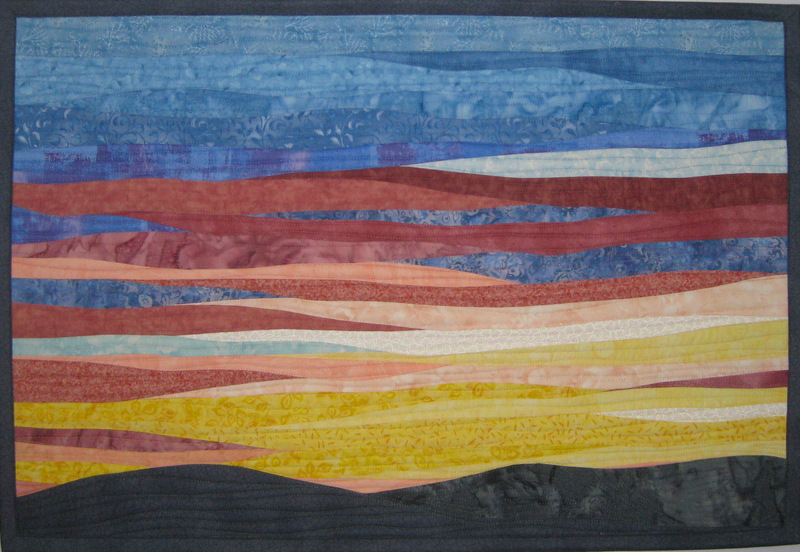 Recently I made “Sunrise 5” art quilt shown here. We had just had a spectacular sunrise the day before for which I have a front row seat from my second floor studio window. I was pumped to try some different colors in the sky after the previous morning’s inspiration. Additionally, I had paid extra attention to the foreground colors during the sunrise and I wanted to push my comfort zone away from my typical foreground of solid fabric rolling hills. I wanted to use a batik in the foreground. 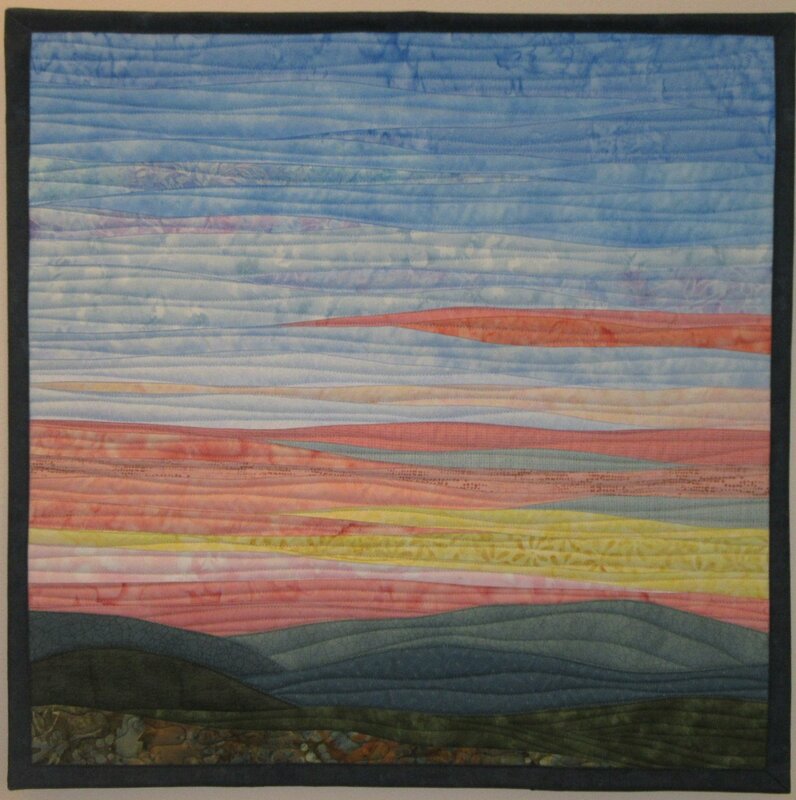 Batiks are some of the best fabrics for landscape quilts. The way colors blend and move within a batik lend themselves to conveying color combinations in nature. I must have pulled out a dozen different green, green brown, grey green, grey green and blue, and brown batik fabrics looking for just the right one for the final foreground piece in this quilt! I would place fabrics up on the my design wall with the now almost finished quilt. I would step back and view it. I would take pictures and view the pictures. And when about the 10th option went up I knew right away it was the one I wanted. 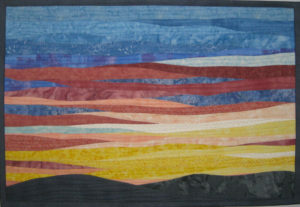 I have included a photo of the foreground of this quilt where you can see the fabric more clearly. Even with my confident feelings this was the right fabric, I still hesitated. I could do what had worked well in the past and people liked….or I could try something new. I’m not a big fan of ripping things out but it must be done sometimes. Realizing I picked the wrong fabric AFTER the binding is on and quilt finished is not when I want to rip and change so this was a big deal change from previous sunrise quilts. I decided to let it hang on my design wall a few days. After seeing it in different light I was convinced it was the right choice. The quilt is finished and it is one of my favorites!! 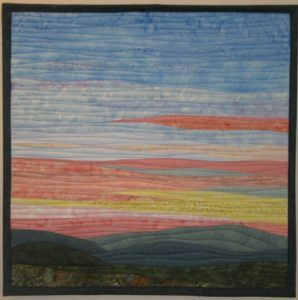 I’ve included a picture of one of my previous sunrise quilts (at the end of this blog) so you can see the difference in the foreground. I like them both but doing something a bit different was fun. The benefit of having a stash of hundreds of fabrics is for times like this which happen often in the art quilt creation process. It would have been harder to go to the store to buy just the fabric I wanted because I didn’t know for sure and it had to be right with the rest of the almost finished quilt. UMMMMM….is this a good reason to go fabric shopping tomorrow? ?